Some months ago I set out to read this book a little at a time. 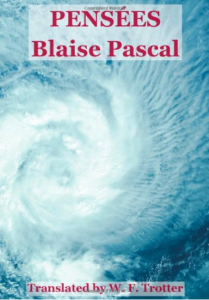 I had read quotes from Pascal all my life but never had read the Pensees myself. It makes for good reading when you have short periods of time because most of the book is a compilation of his notes and thoughts into common subjects. A man of extraordinary genius, Pascal invented an early calculating machine and devised an omnibus service, both of which are very early models of modern day technology. The quotes in this issue display his religious thoughts which still surpass many moderns.